Tom Meltzer’s article was eyebrow-raising for two reasons. I’m not sure whether the guy should be put in the stockade for a week or given a medal but in the article, he validates two timeless direct response advertising truths. 1) Your profits are highly dependent on negotiating rates well beneath the quoted ones. 2) If you have a successful ad (uh, advert) you will get tired of the ad long before the marketplace does. And now onto the big question. Which is really the longest running print ad in history? Ultimately, the question is a moot one because the whole idea for the product and copy had been worked as early as 1919 by Sherwin Cody and his adman, Max Sackheim. Not only are the product and ad copy for the Practical English Programme derivative of Sherwin Cody’s but so is the testing methodology for headlines and pictures. 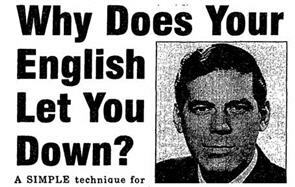 Interestingly, the reason “Do You Make These Mistakes In English?” ceased running in 1960 — the year the P.E.P. ad debuted — was not because it fatigued or because improving one’s English was no longer a viable niche topic in America. It was simply that Sherwin Cody had finally died at the ripe old age of 90 in April of 1959 and his company was sold to a nameless entrepreneur whose first official act as purchaser was to retire the “mistakes In English” headline. Lawrence I hope the guy that bought the company paid a King’s Ransom for it. Reminds you of companies like ATT that pay a crapload of money for a competitor than promptly drop the competitor’s name and throw theirs up in its’ place. Is the Cody ad running under another name now? Or did it die? best article uve ever run.i have an ad thats been pulling 6 times ad cost in 6 hi circ mags bi weekly for 2years.i was going to ask you to beat the control.why when i could be utilising your brilliant skills to write a totally new ad for a brand new product?THANKS FOR WAKING ME UP.ARE YOU READY TO WRITE THE NEW WRINKLE AD? Hi Peter. Thanks for the words of praise. It means a lot coming from you. Sure, ready for wrinkles. Give me a ring. Thanks Lawrence, as usual fascinating and educational! Hey Tina, tell Rusty “woof” back at him. Your launch looks cool!. Mike, alas, the Cody ad is no more. It checked out in 1960 as best as I can tell. An English Prof., Edwin Battistella, wrote a book on Cody which I’ve just started reading. Some great tidbits so far. Just a note about the Cody ad–it ran generally twice a year in the NY Times Book Review but often used variant headlines (such as How to Speak and Write Masterly English). Post-Sackheim the Cody was managed by Victor Schwab (who did a version in the 1950s headlined “Maybe Youse Don’t Talk Like Thism But–“). Thanks for commenting…and very timely since I’m reading your book about Cody! Great research and love the attention to the success/self-improvement industry.